‘An investment in knowledge pays the best interest’, a famous quote by Benjamin Franklin beautifully explains why it is important to do thorough research or carefully understand the investment options in hand, before making a decision. In India, traditionally gold and real estate have been two primary investment options for best returns. However, choosing between the two has always been a fairly difficult choice for most investors. Steady Income: Rental income still remains one of the best ways to generate passive income; and investment in commercial or residential real estate helps achieve this goal. 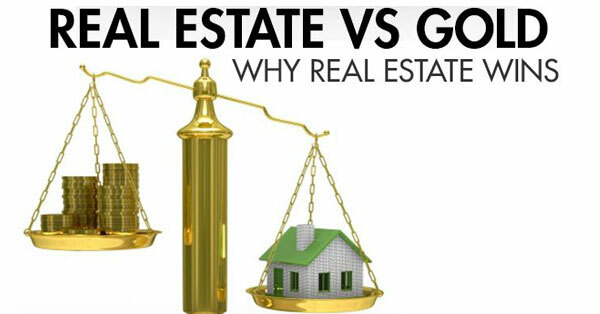 While gold can be “worn”, it does not bring in steady income, compared to real estate which nearly guarantees cash flow through rental returns. Tax Benefits: Home loans taken to purchase real estate become eligible for tax deductions on their interest and principal repayments subjected to a certain limit. This further increases the long-term gain on the property investment. An investment in gold, on the other hand, does not come with any tax benefits. Leverage: A home worth Rs. 70 Lakhs can be bought with a down payment of just Rs. 14 Lakhs (this could be as low as Rs. 7 Lakhs for buyers with an exceptionally high CIBIL score), while the balance amount can be obtained fairly easily as a home loan from banks and financial institutions. Home loans are also the cheapest loans available in the market and reduce the debt burden considerably as compared to other loan types. Purchase of gold on the other hand entails a 100% upfront payment and neither banks nor financial institutions provide financing to allow wealth creation through gold purchases. Higher Returns: Gold generally underperforms real estate in the long-run and this has been the case over the last three years as well, as can be seen from the comparison below. Real estate in OMR, Chennai’s upcoming IT corridor has appreciated 50% over the last 3 years while gold has remained largely flat over the same period. Growing economy: With the economy buoyed by a reform-oriented and development-focused majority government at the centre, the real estate market is showing signs of further growth. This would be expected to further spur price appreciation and give property investors a good return on investment. Gold, on the other hand, has historically underperformed real estate and stocks at times when the economy has been on an upswing. Mortgage benefits: Loans against real estate are available at cheaper rates as compared to loans against gold. This gives the real estate investor an added benefit when funds are required for personal or business needs. To sum it all up, gold would definitely make a good purchase as a fashion accessory or from the perspective of adding some diversity to one’s investment portfolio, but from an investment choice perspective, investment in real estate would be a much better option for the informed investor. If you’re looking for real estate investment options, checkout our projects in Chennai, Bangalore and Coimbatore. Each of our apartments & villas are landmark projects with world class amenities & situated in ideal locations with the best social infrastructure. Apart from fulfilling your entire dream home needs, our properties also promise great capital appreciation and return on investment.